34 Chest / 28R Trs 1 Left! 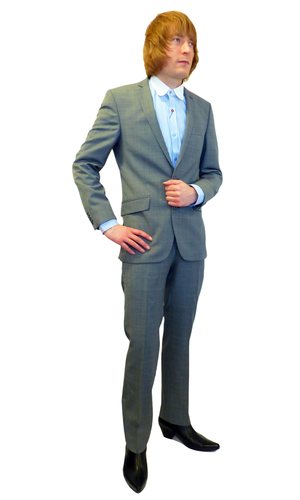 MENS RETRO SIXTIES 2 BUTTON SLIM FIT CHECK MOD SUIT (Grey). 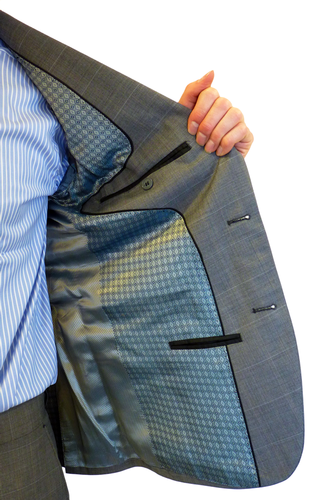 This fab, formal 2 button slim fit Mod Mens suit is perfect for both work wear and leisure. A refined grey Retro check pattern sets the suit off in style and with the slim notch lapels offering a clean, sharp Vintage Sixties look, this Mens Mod suit is sure to be a valuable addition to your suiting collection. A suave and sophisticated 2 Button slim fit Mod suit with styish slim Retro notch lapel and 2 flap pockets to sides. A subtle grey Vintage style check, 4 buttons to the non-working cuffs and side vent feature. Psychedelic Sixties diamond pattern lining. 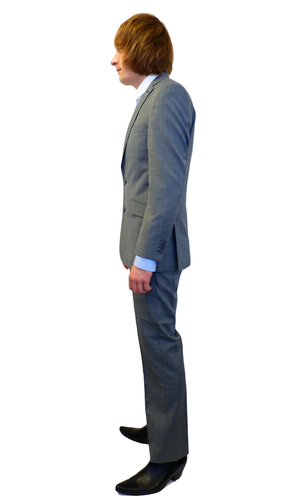 A classic slim fit Mod suit. The matching trousers feature a stylish tailored Mod clasp and button tab fasten to waistband, zip fly and are in a cool and classic slim leg fit. Traditional belt loop detail, 2 slant pockets to front and button down jetted pockets to reverse. RETRO SIXTIES MOD 2 BUTTON SLIM FIT CHECK SUIT. 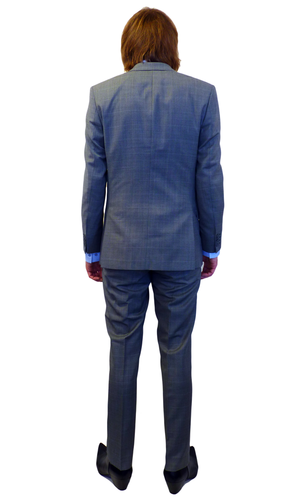 RETRO SIXTIES MOD 2 BUTTON SLIM FIT MENS CHECK SUIT - Mens grey check Slim Fit Mod Suit with slim Retro notch lapel, 2 classic flap pockets and the traditional open welt chest pocket to left side. Sixties Psychedelic diamond pattern lining, 4 buttons to non working cuffs. Side vents and button hole detail to lapel. Trousers feature 2 slanted side pockets, 2 button down jet pockets to reverse, slim leg fit. Zip fly, button and clasp waistband fasten. Composition: 55% Polyester, 45% Wool. SKU: S12142P2S Grey Check 2 Button Suit. Mens Retro Sixties Mod 2 Button Slim Fit Grey Check Suit. Comes as a set (Blazer and Trousers). Waist size on trousers is to match the corresponding chest size.